Enjoy your coffee with this selection of stylish coffee sets. The Café-Java Coffee Set is beautifully packaged and designed, adding a touch of sophistication to your coffee experience. 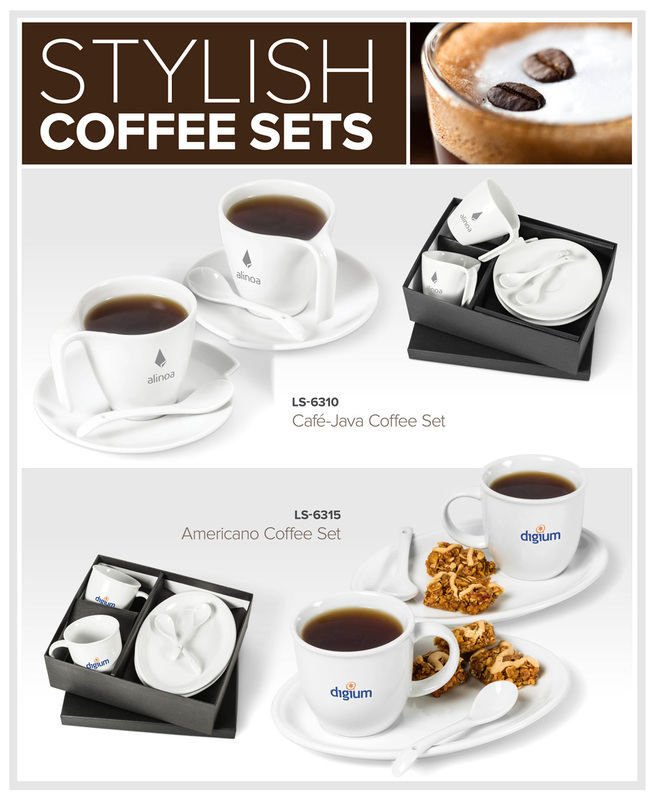 If you prefer something sweet with your coffee, the Americano Coffee Set offers a wide saucer to accommodate your treats. The Scoop Coffee Mug comes with a coloured spoon and can be printed with your company logo. The Scoop mug is one of the few coffee mugs that is ..
stainless steel outer / PP liner / 0.45L / 17 ( h )power cord plugs into car lighter or USB plugto heat cup contentscar lighter chargerUSB plug .. Features:Matching Colour Handle354ml CapacityAlso Featured; Curve Mug & Stylish Mug..
A Branded Mug makes the perfect marketing product. Every time your clients use branded mugs for tea or coffee they will be reminded of your comp.. The affordable Au Lait Coffee Mug makes for perfect year-end gifts!Add a full-colour logo print, and present this mug to clients and potential custome.. Features Of The Expose Coffee Mug: AB grade ceramic / 0.325L / 10.5 ( h ) includes matching colour gift box ..
Showcase your company logo and complete your event with the BPA FREE Altos Mug! With a vibrant choice of colours to choose from, add a sense of fun an..
We are excited to introduce the innovative colour changing coffee mug for the year-end gifting season! This mug is perfect for a full colour sublima..
Andy Cartwright has brought together design and chocolate to create one of South Africa’s most unforgettable executive gifts.This premium dark chocola.. The range of elegantly presented carving knives are proven executive gifts. Perfect for casual or formal dining, your clients will appreciate these ..
Our 2015/2016 Gifting and Headwear Catalogue is our most comprehensive gifting catalogue to date. Some items require explanations and some existi..